The signature Classic style map uses a bright, easy to read color palette featuring blue oceans and stunning shaded relief that has been featured on National Geographic wall maps for over 75 years. 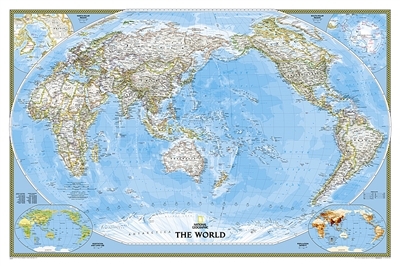 The Pacific Centered World map employs a unique view to accentuate the Pacific Rim, and focuses on Oceania and Asia and while showing the entire breadth of the Pacific Ocean. Drawn in the Winkel Tripel projection, distortions are minimized and unlike many other World maps, Greenland is show the same size as Argentina and not as the size of all of South America. Thousands of place names are carefully and artistically placed on the map to maintain legibility even in the heavily populated ares of Europe, Asia and the Middle East. Details include clearly defined international boundaries, cities, physical features, rivers, and ocean floor features. Corner inset maps feature vegetation and land use, and population density as well as the north and south polar regions.